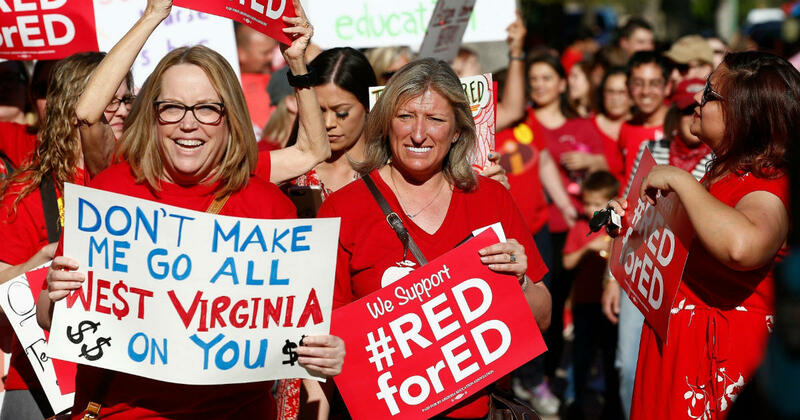 Teachers in Arizona nod to those in West Virginia. Board: Talk to me about the omnibus bill. It is a rapidly changing scenario. But you spoke with your caucus members today. Is that true? Craig: Yeah. So we're in constant communication, just to stay organized and to stay informed. We've been doing a lot of grassroots organizing and deep organizing around this issue and around other similar to fight for what we feel is right for education and to fight back against what we feel is not right for education, which is this bill. Board: Tell me more about what you think about this bill. Craig: There are so many components. A five percent teacher pay raise, which is absolutely needed to continue to keep the quality educators that we have in our state, but it groups everything to Union busting tactics and to provisions that are very, very scary and dangerous for our schools -- like charters and privatization and increase class sizes. And what I want to focus on is what this bill doesn't address: increased mental health care in our schools. We know we're facing opioid crisis, we are fourth highest in the nation and childhood poverty and we are severely lacking mental health professionals, school psychologists, counselors, nurses, Prevention Resource Officers in our schools to meet our students mental health needs. And the so-called education reform bill fails to address that this bill and actually raises class sizes at the elementary level. So the most critical levels, first grade through sixth, grade it raises the class capsized from 25 (what it is now) to 28 and in third through fifth they're also provisions that will raise it three over three in extraordinary circumstances. So you can have up to 31 students in a class. Tell me how increasing the class size and having a class of 31 young elementary students is actually going to reform and make things better for our kids. But perhaps the most dangerous part of this is the provisions for charters and privatizations. We feel this bill is so bad for public education and for our students that we are willing to say no to this bill altogether, including the 5 percent pay raise and the additional monies into PEIA. We will not accept a pay raise under the circumstances of this bill and under the provisions that take public money away from our students. Board: But some charter schools function. Some charter schools work. With West Virginia being so far behind in so many ways, isn't it possible that a charter system in certain places might improve circumstances or shake things up, bring something new to the table, new techniques where some boards of education perhaps are just unwilling to take that risk? Craig: That thinking that understanding is a bit flawed because it assumes that the problem with education is within the classroom and the teachers themselves. Look no further than Ohio at the disaster that they've had, and the charter schools Arizona. Around 90 charter schools closed just this year sending an influx of students back to public schools without the funding to actually teach them. That's why the teachers in Los Angeles went on strike -- the biggest thing was what charters have done and gutted their schools or public money. What we instead should be focusing on is increasing the services that we do have for the students that are in our public schools instead of moving and pushing towards a system that we know has systemically failed and so many states. We need to instead focus on sending more funding more resources to our schools, starting with the mental health crisis that are facing our schools. That's what's going to increase our student achievement. You talk about math scores. Time and again, we hear how far behind we are behind. But we fail to really realize why. Our kids are at crisis level. We know that one in four children of West Virginia has experienced adverse trauma, psychological childhood trauma. And so we need to combat that with 1.) smaller class sizes, 2.) more autonomy in the classroom where teachers can actually teach the students on their level and be able to gauge the instruction based on that and less testing and those are the things those are the things that are going to actually increase success in our public schools. Jenny Craig is a special education teacher at Wheeling Middle School, Ohio County Education Association president, and a steering committee member for the West Virginia United Caucus. The caucus is a coalition of educators who represent a variety of unions. Craig says she plans to join a rally at the Capitol on Thursday this week that’s being organized by parents, community groups, and educators.